A cousin, Ryan Thompson, believes the potential witnesses may never come forward because they "could go to jail as accomplices"
This photo from Oct. 7, 1986 shows Run-D.M.C. 's Jason Mizell, known as Jam-Master Jay, as he pose during an anti-drug rally at New York's Madison Square Garden. A mural of Run-DMC's Jam Master Jay, his arms crossed in defiance, looms over the hallway of the Queens recording studio where he was shot to death 15 years ago. The memorial gives no hint of a disturbing footnote to the DJ's tale of fame and misfortune: The killer, so far, has gotten away with it. New York City police detectives acknowledge that their investigation into the October 30, 2002, killing of the artist, whose given name was Jason Mizell, has gone cold. But some in the borough where Jam Master Jay, Joe "Run" Simmons and Darryl "DMC" McDaniels emerged as rap sensations in the 1980s hold out hope that witnesses could still come forward. "It's not resolved to the legal eye, but the street always talks," said Jeremy "JL" Lam, a friend of Jam Master Jay's family and a partner in the latest version of the Queens studio. Family members, however, are less optimistic. 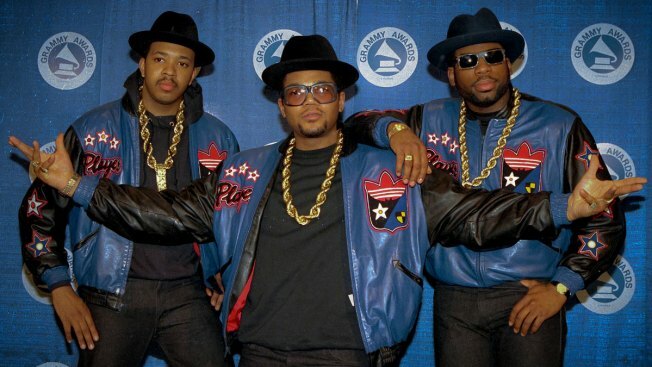 "We know it's any anniversary but we don't like to talk about it much anymore," Jam Master Jay's older sister, Bonita Jones, said from their mother's home in North Carolina. A cousin, Ryan Thompson, believes the potential witnesses may never come forward because they "could go to jail as accomplices." Thompson, also a DJ using the moniker "Base," credits himself with introducing Run-DMC to one of its signature fashion statements: Adidas sneakers without laces. But Mizell should be remembered more "for the music he created and his kindness." That music included spinning the turntable on such Run-DMC hits as "King of Rock," ''It's Tricky" and a remake of Aerosmith's "Walk This Way." And one of Jam Master Jay's acts of kindnesses included opening a 24/7 studio in a then-violent section of Queens for artists who needed a start. Famed rapper 50 Cent was among those he mentored there. It was in that studio on the night before Halloween 2002 when police say two armed men were buzzed inside. Thompson, once hired as security "to keep the riff raff out," said he had left the job because he wasn't getting paid. According to some reports, the 37-year-old Jam Master Jay hugged one of the men before gunfire erupted. One round missed him but a second, fired from point-blank range, entered the left side of his head. The men vanished. Speculation followed that Jam Master Jay, who was drowning in debt, may have been killed on orders from someone to whom he owed money. Police said there were at least four other people in the studio at the time. But none provided enough details to produce fruitful leads. Thompson said a security camera in the studio was broken. Prosecutors later identified a career criminal serving time for armed robbery a suspect. But he denied involvement and was never charged. Then the case went cold. Following the killing, a news photo showed Jam Master Jay's body being removed from the back of the building through an emergency exit while mourners flocked to the scene to pay tribute. Two more showed DMC hugging Public Enemy's Chuck D during the impromptu wake and a handwritten poster reading, "Rest in Peace, We'll Fight 4 Justice." Fifteen years later, reminders of the tragedy are harder to find. There's the recording studio mural and, inside, a plaque on a closet door with his "JMJ" record label insignia. "He's right there, so there's no getting away from it," performer Jaquan "Tipsy" Hardaway, said of the mural as he walked into the studio last week. A founder of the current Signature Soundz Studios, Alix Dontfraid, agreed that it still feels a "little spooky" there. But he also tries to stay positive. Jam Master Jay "could have built this studio anywhere, but he built it here, where it was needed," he said. "That's an energy I'm trying to perpetuate."